Priyanka Chopra was spotted at Mumbai's Chhatrapati Shivaji International airport, when she returned from the Don 2 shoot in Malaysia. Director Farhan Akhtar accompanied his leading lady. The Thank You team -- Bobby Deol, Celina Jaitley, director Anees Bazmee, Sonam Kapoor, Suniel Shetty and Akshay Kumar -- got together to promote their film over the weekend. Abhishek Bachchan arrives at the Big Star IMA Awards at Filmcity, Goregaon, in the western suburb of Mumbai. The awards raised a toast to the best in the music industry. Abhishek was one of the performers for the night. The awards ceremony saw quite a few people from the film industry like Karan Johar. 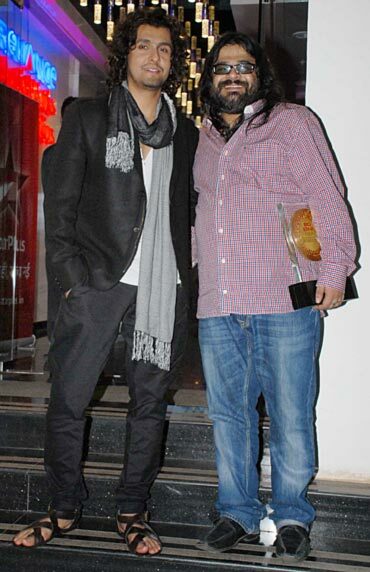 Sonu Nigam, seen here with composer Pritam, obviously needs a quick fashion lesson. Chak De! India girl Vidya Malvade arrived with husband Sanjay Dayma. 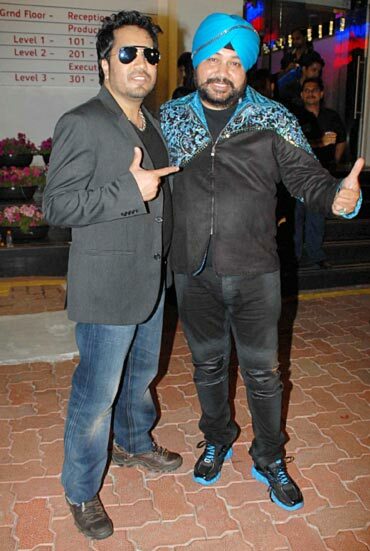 Brother Mika and Daler Mehndi cut a happy picture at the music awards night. Rati Agnihotri dropped in on the sets of her son Tanuj Virwani's debut film, Love You Sonia in Sophia College, South Mumbai. What do you think of SRK's Don 2 look?